“Open water swimming means coming home. My dad taught me to swim in a lake in Pennsylvania. I loved the water. About twenty-five years ago, I heard of a two mile swim at Lake Berryessa. I decided to train to swim it. When the day of the swim came and I stepped into the water, I knew why I was there. It felt, looked and tasted like the lake I learned to swim in. 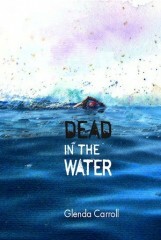 Dead in the Water is not only Glenda’s first book; it’s her first book on swimming. Up until this novel, her work focused on other outdoor activities. “I have been a writer of one kind or another my whole life, beginning with writing a gossip column in my middle school newspaper. I learned to sail in my 30s, sailed to Hawaii from San Francisco and raced sailboats for about ten years on the SF Bay. I also headed up an organization called Yacht Racing Association of SF Bay for seven years. I didn’t join a masters swim team until I was in my 40s. I was in my 50s when I learned to surf. So I am a late blooming water woman, but the underpinnings were always there. And luckily, I am blessed with a certain amount of athletic ability (well, maybe more determination than ability). I never wrote about swimming. I didn’t want to. And I didn’t know I was going to write a mystery until one day I sat down and started. 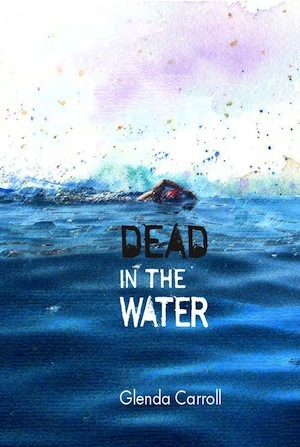 Dead in the Water was as big a surprise to me as it was to everyone else. I follow the old adage, ‘write what you know.’ I was a sports journalist for many years and every now and then someone would ask, ‘do you have a book in you?’ My response was always, ‘how can you write about something that isn’t true.’ So for me things are based on truth, but then I escape into the thriller world and take it from there. Writing the novel was not easy. Often I found myself wondering what the next sentence, paragraph, chapter, should be. I would get up from the computer go outside and cut the grass. I had, at that time, an old push lawnmower; I cut the grass a lot. In fact, I must have had the shortest grass in my neighborhood. And speaking of outdoor sports – Glenda also works in Guest Services for the Giants. “ I do everything from scan tickets, to take care of a section of the ballpark, answer questions or run an elevator. This is my third year there and during that first season, the team won the World Series and I got to be in the World Series parade. What a way to start a job! 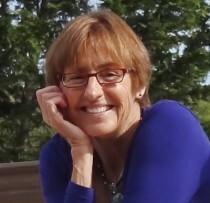 “I’m working on the second draft of the next book in the series (Trisha Carson mysteries). It is called Drop Dead Red. It features many of the same central characters. It is still involved with the open water world, but not quite as much. AT&T Park and the Giants play a bigger role in this book than in Dead in the Water.